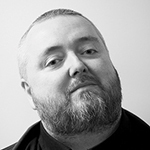 Thomas Walsh (born 9th August 1969) is the lead vocalist and songwriter of Pugwash. With a passion for pop music since his tender youth, Thomas was very active in different fan clubs as a teenager, including the ELO fan-club. In the late 80’s / early 90’s he recorded his first demos as The Sepia Circle. Soon after he founded Pugwash and released a few demos. Meanwhile Thomas worked as a guitarist on records and tours with Kim Fowley and Andy White. Following those experiences, Thomas signed Pugwash to Vélo Records in 1999. After a few releases Thomas got a name in the Irish scene and many friends including Dave Gregory and Andy Partridge of XTC. In 2005 he set up with Daragh Bohan the label 1969 Records, on which he subsequently released several Pugwash albums with many guests. In 2003, at the wedding of their mutual friend Graham Linehan, Thomas and Neil Hannon meet up. Despite them not directly keeping in touch with each other after that, Thomas managed to invite Neil a few year later on a Christmas charity single. This will be followed by a constant collaboration with Neil Hannon playing on Thomas’ records, Thomas playing on Neil’s, and both of them founding a new band The Duckworth Lewis Method. The time that followed The Duckworth Lewis Method was a period of change for Thomas. Thomas had to care more of his health and no longer touched a drop of alcohol , and also thanks to the Duckworth Lewis Method gained more recognition, including a few words from his hero, Jeff Lynne. This led Thomas to run a new line-up of Pugwash with former members of Saville. As a dedicated musician, Thomas has also played for numerous artists, including Saville (Somnambular Ballads, 2003), Paul Bohan (For Now & Ever, 2010), Matt Berry (video edit of ‘So Low’, 2011, and Kill The Wolf, 2013) or Ken Simpson (You’re No Fun Anymore EP, 2012).